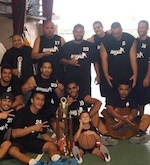 The American Samoa Basketball Federation has received sufficient funding through their NOC's Olympic Solidarity funds to allow two Zone Development Officer visits in 2004. President of the federation, Mr Ken Tupua, was delighted to have his requested approved by the National Olympic Committee. "We plan to have one visit early in the year, and the second in August. The August visit will coincide with the National Teacher's In-Service week, at which we plan to conduct coaching accreditation courses for the local teachers. Such a course will really help to improve the level of coaching provided to our younger players by the school teachers. We will also conduct a summer vacation camp during the August visit following the success of our first camp held in 2003". Sincere thanks go to the American Samoa NOC for allocating these funds to assist FIBA Oceania to continue their development work across the Pacific.